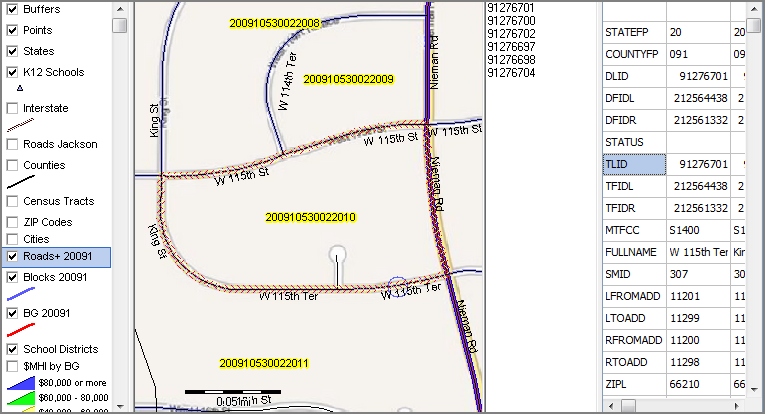 This section illustrates use of the TIGER/DMD software to view/analyze/update edge/road segments for an area located in Johnson County, Kansas located in the Kansas City metro. 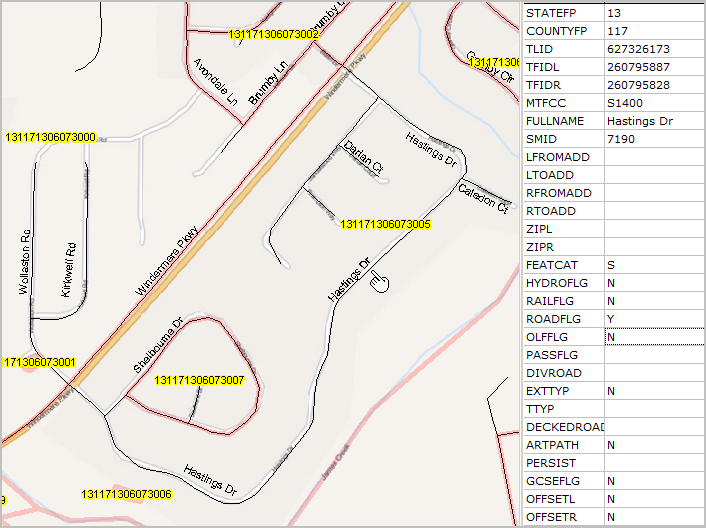 The map graphic shows Census 2010 census block 20-091-053002-2010 (census block codes appear with yellow label) in the context of area roads. The road segment selection tool is used to select bounding road segments (highlighted with cross hatch). 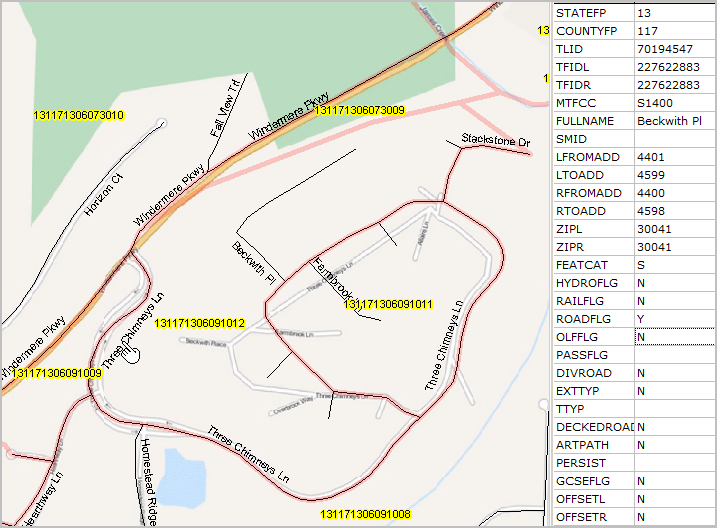 These six segments are listed by TIGER ID in the listbox to the right of the map view. A partial view of the attributes of these segments is shown to the right of the listbox. A full detail view of this grid is shown below the graphic. 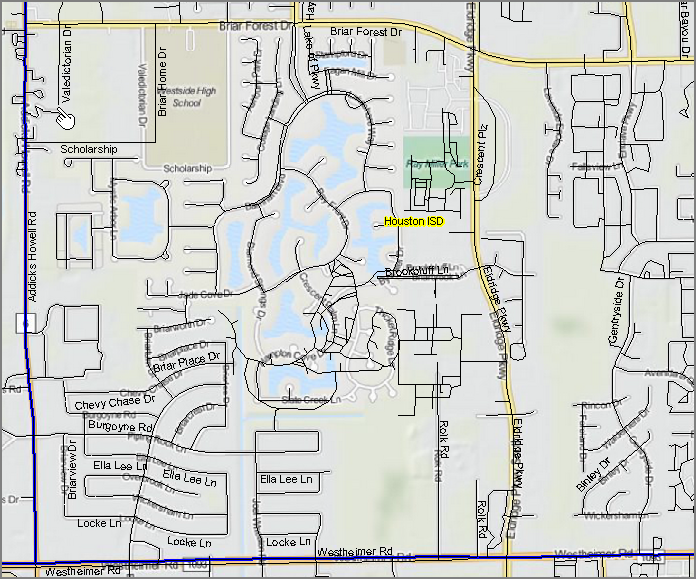 The Nieman Road segment (third road/edge column) is a school district boundary. See that attribute "UNSDLEA" in the third section shows "12000" (Blue Springs) for this segment whereas all other segments on the left and right side are in school district "10140" (Olatha). TIGER/DMD provides the ability to update school district boundaries rather quickly; rather than experiencing the 2-year update timeframe by the U.S. Department of Education. The TIGER/DMD also offers the ability to code school district attedance zones whereas TIGER/line does not. These road segments are located in the core urban area of a metro. As a result, the overall quality as conveyed in TIGER/Line is quite good. Many TIGER mapped areas are not this good and including many in the KansasCity area. See the Houston area map below that illustrates widespread inaccuracies in 2012 TIGER/Line. The next view shows an area within Harris County, TX (western section of Houston ISD; school district boundaries appear blue) where road structures in the 2012 TIGER/Line edges file are quite poor. Valdictorian St. (upper left in view) runs adjacent to Westside High School campus, but located incorrectly west of that area. Scholarship and Briar Home are likewise incorrectly positioned. There are many streets incorrectly located elsewhere in this view; southern section around water features; many roads to west of Eldridge Parkway. The next view shows an area in Forsyth County, GA where road structures in the 2012 TIGER/Line edges file are quite good and OpenStreetMap roads are incorrect. While the TIGER roads structure is good overall, many problem issues remain. The road above the pointer is divided but is shown as non-divided both visually and in the attribute profile. Census 2010 census blocks appear with semi-transparent boundary. In a nearby area, same county, the next view shows that the address ranges values are missing from TIGER segments.